Happy New Year to you all! I hope you're not too hungover ;) It was a relatively quiet one for us - no parties, little drinking, just a cosy night in. We don't have many of those! As the new year begins, we're beginning to think about and plan what we want to achieve in the next 12 months. The last year has been a particularly slow one in terms of how much renovation work we've actually got done. We've achieved a finished bathroom (with a few little niggling things left to complete!) and a partially renovated spare bedroom. But this isn't exactly a lot for 12 months work... although the bathroom did take a large proportion of our renovation money pot - Let's blame the lack of money! You can read about our yearly cost round up in my last post here. But looking forward, we're onto the next year of renovating our home and we have lots we want to achieve this year! We've spent the last 18 months without a cooker, 18 months with a leaky conservatory roof dribbling water down our kitchen door (don't judge!! ), 18 months battling the mouldy shower room, 10 months with two holes in our kitchen ceiling and 4 months without kitchen flooring. Can you guess what's room's next on the to-do list? Eurgh! I just hate to share this photo, it's so depressing, embarrassing and quite frankly, shameful. This is our kitchen. I hate those words, I hate that room. 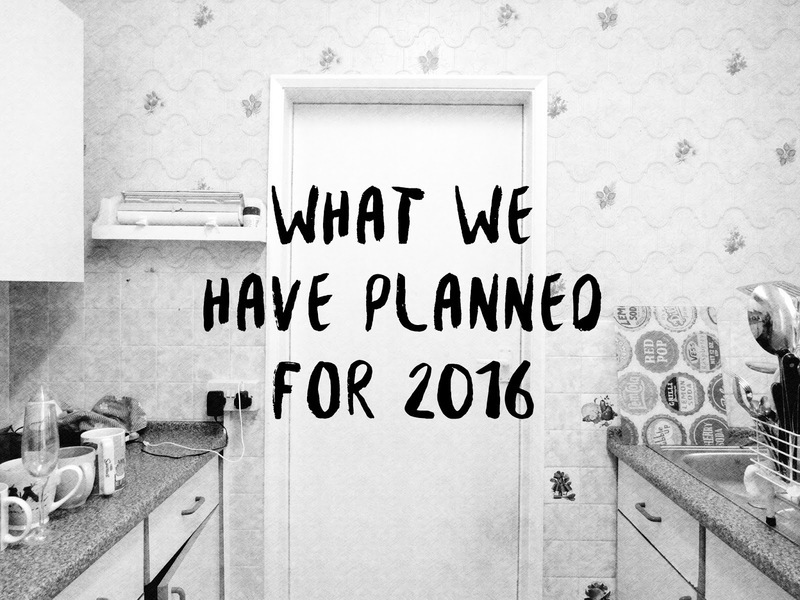 So, 2016 is (fingers crossed) the year of the new kitchen. Remove two walls to open up the kitchen into both the dining room and the shower room. Install external french doors where the existing windows in the shower room are. Install a gas line into the kitchen which means we can finally have a cooker! Replace the old lead water pipe with a new copper equivalent. Buy and fit new kitchen units and new flooring. Elsewhere in the home, we still have a few jobs we've started that need completing and a few smaller DIY jobs on the to-do list. The two main jobs here are to build a fire pit and lay some sort of paving/flooring. Not the biggest of jobs but a little time-consuming and money-pinching non-the-less! This area of the garden is seriously lacking that 'finished' look. I don't often photograph this area of the garden since it's so damn ugly! But we do have plans to spruce this area up... Once those frosted windows in the shower room are converted into french doors, we'd love to turn this dumping ground area into a proper patio. The decision between stone or decking is one we just can't decide on - hopefully once the doors are fitted we'll have a clearer vision in our minds. This one'a a major essential this year - replace our conservatory roof! It's been leaking since we moved in and it's progressively getting worse. The timbers are rotten in places (although they already were! ), there's evidence of wood worm in the past and generally this whole conservatory looks like it needs pulling down and re-building. Not a job we want to do just yet, but fixing a new temporary roof will hopefully keep it up a little longer! It's been there almost 30 years so far, I'm sure it can last a little longer..! This is the last job left to finish in the bathroom. We had to wait to complete this job until the new cable for the shower had been laid. Now that's been done, we really need to finish this non-existent cupboard. It really is quite the eye-sore of the room! We've made huge progress on this room recently (posts to follow soon!) but it's still not finished. I'd like to turn this room into a guest bedroom come study and fully tick this room off the renovation list! So that's our plan for the next 12 months - what are your plans for the new year?